This page last updated: 19th September 2006. 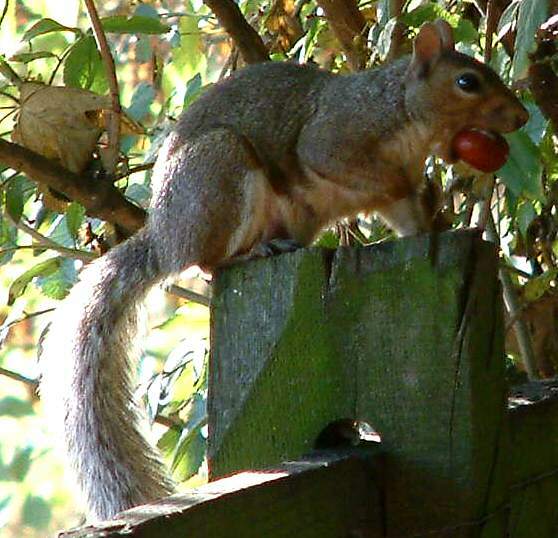 This squirrel was seen in Nottinghamshire, September 2003. At first I thought this was a red squirrel. However I have since discovered that it is in fact a grey squirrel. Grey squirrels can have a fair quantity of reddish fur, especially young males, and this does cause confusion. I am indebted for this information to Doreen King and her book SQUIRRELS IN YOUR GARDEN (Kingdom Books, 1997; ISBN 1 852790 28 8).